Our Valentine weekend was really HOT! 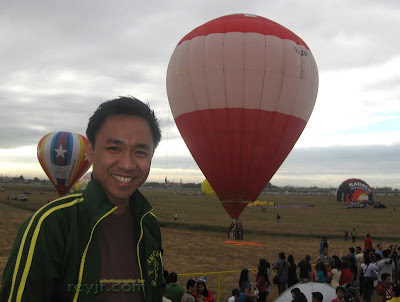 The 15th Philippine International Hot Air Balloon Fiesta. We were up bright and early on that sunny Valentines Day morning as we made our way through the streets of Clark Air Base. We had stayed at Hotel Stotsenberg for the evening after Duty Free Shopping and dinner at a grill and wine restaurant. We got lost several times while looking for a dinner place there, and so we read the directions to the Fiesta venue carefully. Thankfully we did not get lost again! "...sa dagat at bundok, sa simoy at sa langit mong bughaw..."
"...Ang kislap ng watawat mo’y tagumpay na nagniningning..."
Right after that, a band began to play and children in bird costumes began their dance program. Unfortunately for us, we couldn't really see the kids perform because there we so many people. Seriously, there were more than 5,000 in attendance! They're full of hot air! 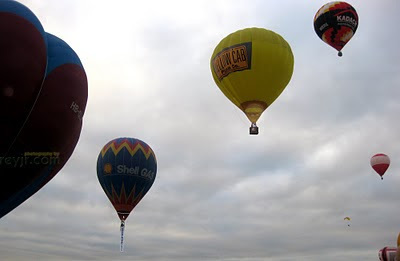 The most remarkable of the hot air balloons were those not of the typical spherical form - there was a sun complete with rays, a turtle, a beer bottle and even a barn with cows! 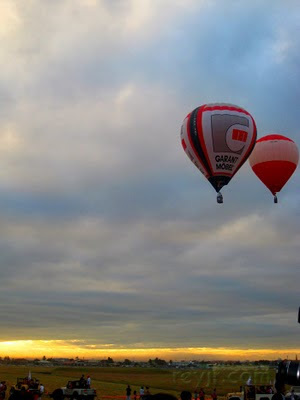 We stayed at the venue until all of the balloons were up in the air and headed back to Hotel Stotsenberg for breakfast. After a quick breakfast, we rested a bit then checked out and headed back to the Fiesta. Walking around we saw some souvenir items, shirts and hats, a real Yellow Cab, big motorbikes, small aircrafts, and a lot of people flying a lot of kites. We cooled off by eating Chowking HaloHalo and SnowCones. By then the heat had become too much for Liz and so we decided to head back home to Manila. We had our fill of fun in the sun - it was definitely a hot and awesome Valentine's Day. Book your hotels early - like 2 or 3 weeks in advance. They will run out of rooms my the last week before the event. Go early to avoid the traffic jams and the long queues. 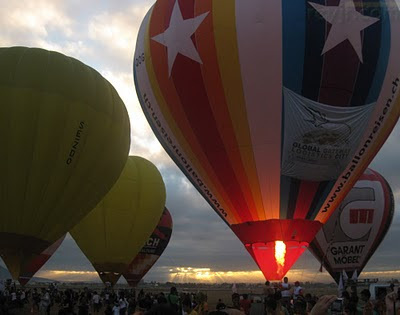 They time the flight of the balloons at sunrise so it would be good to be there before 6am. Bring a mat or a small chair to sit on. Or a tent. Bring an umbrella or a huge hat. And dark eyeglasses. Wear clothes that are cool and comfortable - it will be very very hot especially at noon. Expect some downtime - bring a book, a kite or a gameboard - something to pass the time. Or you can just go back to the hotel or go shopping at a Duty Free Store in Clark or go somewhere where there's air conditioning - just get a stamp on your arm on your way out. You can click on the photos to view them in full size. how very cool. 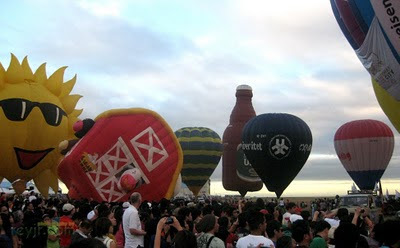 love hot air balloons...and all the creativity in their colors and shapes...fun trip! Very cool! Thanks Brian. It was fun indeed. Different from our typical vacations. 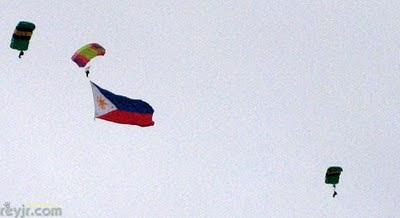 Ha ha ha.. kailangan talaga Rey na i-emphasize na point and shoot ang camera? LOL! Go na, buy na ng DLSR!!! 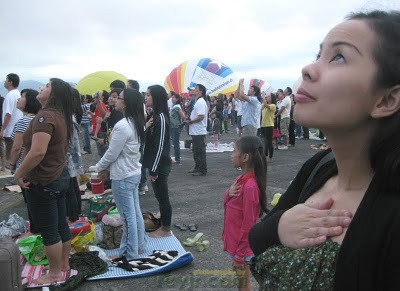 I long to watch that festivity.. Pero, wala akong makasama, he he he. No picture of you riding the hot air balloon. Four words: Bok - bok-bok. Chicken! Ahehehe. Belated Happy Valentines! That's really an awesome way to spend Valentines. I somewhat got this "The Ugly Truth" film feeling when I saw the balloons and all. Nice! Sayang, di ka namin napuntahan. sumasam na ang pakiramdam ko noon, pero nagwowork pa rin ako. Anyway, ang gaganda ng kuha. punta kayo ni Liz next time para mamasyal tayo naman sa fields' avenue ...lol..sa night life. Andun din daw sina Bloggista and Ceblogger.